Have patience with everything that remains unsolved in your heart. Try to love the questions themselves, like locked rooms and like books written in a foreign language. Do not now look for the answers. They cannot now be given to you because you could not live them. It is a question of experiencing everything. At present you need to live the question. Perhaps you will gradually, without even noticing it, find yourself experiencing the answer, some distant day. René Karl Wilhelm Johann Josef Maria Rilke (4 December 1875 – 29 December 1926), better known as Rainer Maria Rilke (German: [ˈʁaɪnɐ maˈʁiːa ˈʁɪlkə]), was a Bohemian-Austrian poet and novelist. He is "widely recognized as one of the most lyrically intense German-language poets". He wrote both verse and highly lyrical prose. 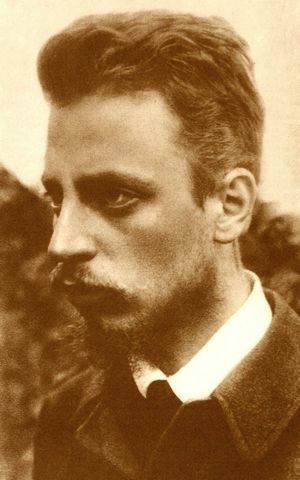 Several critics have described Rilke's work as inherently "mystical". His writings include one novel, several collections of poetry and several volumes of correspondence in which he invokes haunting images that focus on the difficulty of communion with the ineffable in an age of disbelief, solitude and profound anxiety. These deeply existential themes tend to position him as a transitional figure between the traditional and the modernist writers. Nights of anguish. Inconsolable sisters, why did I not kneel more to greet you, lose myself more in your loosened hair? Love is like the measles. The older you get it, the worse the attack. If your everyday life seems poor to you, do not accuse it; accuse yourself, tell yourself you are not poet enough to summon up its riches; since for the creator there is no poverty and no poor or unimportant place. Who knows? perhaps the same / bird echoed through both of us / yesterday, separate, in the evening . . . Either the United States will destroy ignorance or ignorance will destroy the United States. People often feel threatened by things that are different. It reflects their ignorance, not your reality. A jury is composed of twelve men of average ignorance.